Signage for Chupacabra Latin Café was recently installed at Reynolds Village, North Asheville’s first large-scale, mixed-use development. Local sign and visual graphics provider FASTSIGNS® of Asheville completed the design, fabrication and installation of the new restaurant’s sign, just in time for its grand opening in early May. 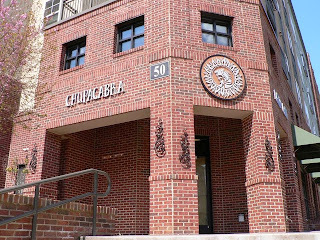 “We didn’t have a set idea of what we were looking for, but we did have a strong sense of our restaurant’s identity and wanted the artistry of our sign to accurately reflect our vision,” said Emily Abernathy, co-owner of Chupacabra Latin Café. Chupacabra had a conceptual design, logo and typeface, but the new restaurant wanted to incorporate metal, wood, dimension and texture in their exterior signage. FASTSIGNS of Asheville consulted with the restaurant and the team came up with a quality solution that stayed within the restaurant’s budget. To create a distressed metal look, FASTSIGNS of Asheville used a faux finishing treatment on the 1-inch thick PVC dimensional letters.